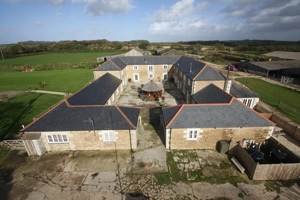 Photographs from an Elevated View using our tall extending telescopic mast with it's remote control Digital Camera will prove to your web clients that you are not operating out of an accommodation address, home lockup or even offshore! 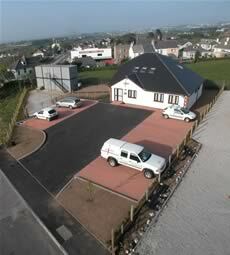 An aerial photograph would show that your premises have room to park. The images can illustrate your fleet or service vehicles. In short, your credibility can be established at a glance with Elevated Photography. 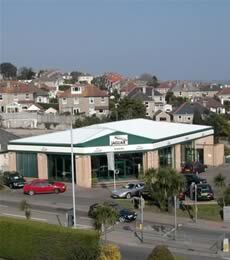 We can superimpose your logo on your roof or onto the car park! We could show your stock in your warehouse or stores department and prove that you are not one of the growing band of “just in time” operators. If you have a Garage or Service Repair Centre, one shot gives the best impression of the total range of your Motor Trade activities, other kinds of premises will also benefit from such an overview. 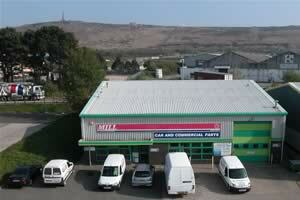 Commercial Premises can be Photographed with a 'Moody' Theme. A dawn or dusk shot creates a magical atmospheric mood. Night photos gives the impression of a 24 hour operation. Floodlighting with it's colour tinting, captures a corporate theme and turns a “shed” into a showstopper! Reflections of early sun into plate glass windows adds a golden glow. Illustrating the seasons using the elements of snow, wind, frost or rain can remind your customers to order before the rush. Incorporating Local Landmarks in your promotional photographs aids you by putting your business in context and helps clients to find you. Photographs taken over a period of time can illustrate many changing aspects of your business. Before, during and after development and expansion for example are greatly emphasised by High Level Photography. overviews & time-lapse pictures ensure conditions of buildings are recorded & surveyed without the need to hire scaffold. The mobile unit can be on location to act as a production unit to deliver CDs or proof prints on site. An independent self lifting mast can be guyed if vehicular access is restricted. We do what 'YOU' want 'WHEN' you need it. Because we are Local and based in Cornwall, we can normally respond at short notice for that urgent commercial photography requirement that has been waiting for the weather to break or has been delayed for whatever reason. In fact any Subject or Event that your Business is involved in. Don't let your competition outshine you with this 'Flattering' form of Commercial Photography, get your business there first by making the most of an Elevated Photography Commission to get your enterprise ahead. Cornwall has many Dynamic businesses and stunning Locations that when Photographed using our Elevated Photography System, will provide you with a powerful Promotion Tool.